After the Second World War, the Greek government mandated that, except for Muslims, no non-Greek minorities lived in Greece. Slav Macedonians became Slavophone Greeks. Vlachs became Vlachophone Greeks. Also at this time, Metaxes forced nomadic peoples of Greece to become seasonal migrants, changing location ONLY to follow sheep pasturage between lowlands and adjacent mountains. These formerly nomadic shepherd groups disdained music as a profession, relying on the Yiftoi who spread musical themes and styles among their clients. The Karagounides are Vlach. The name means Wearers of Black Capes. Such capes were, and continue to be worn in areas well outside of modern Greece, such as the Bosnian mountains. The Karagounides of Karditsa in Thessaly gave us the dance Karagouna, meaning Black Cape, although performing ensembles have changed the dance quite a bit for the stage. 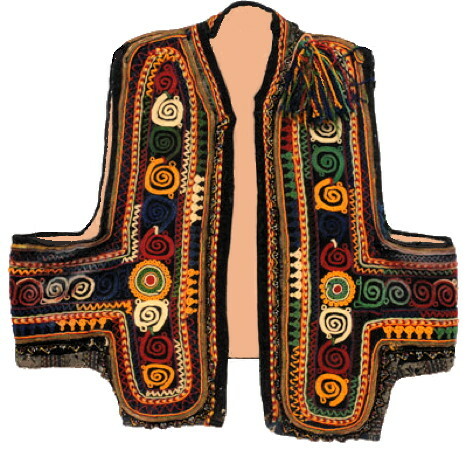 The traditional Karagounides woman's costume employs deep shades of red and orange.